Enjoy FREE golf, FREE fishing, FREE parasailing, FREE Baytowne Wharf adventure zone pass, and FREE movie rentals each day of your stay. 1 adult pass per activity per day. Explore SoWal Package does not include stays over 14 nights. Inquire for rules and restrictions. As you step into this open-concept condo you will notice the travertine floors, trendy-rustic lighting above the dining area, wooden ceilings and contemporary furniture. The modern, updated kitchen has all the comforts of home with luxurious, sleek granite counter tops and stainless steel appliances. In the living room you having amazing views from your private, fourth floor balcony that is on the quiet side of the building - you will have no problem relaxing while you listen to the waves! The unit also has 3 HD Sony and Samsung flat screen TVs and two DVD players -the living room is also outfitted with surround sound! 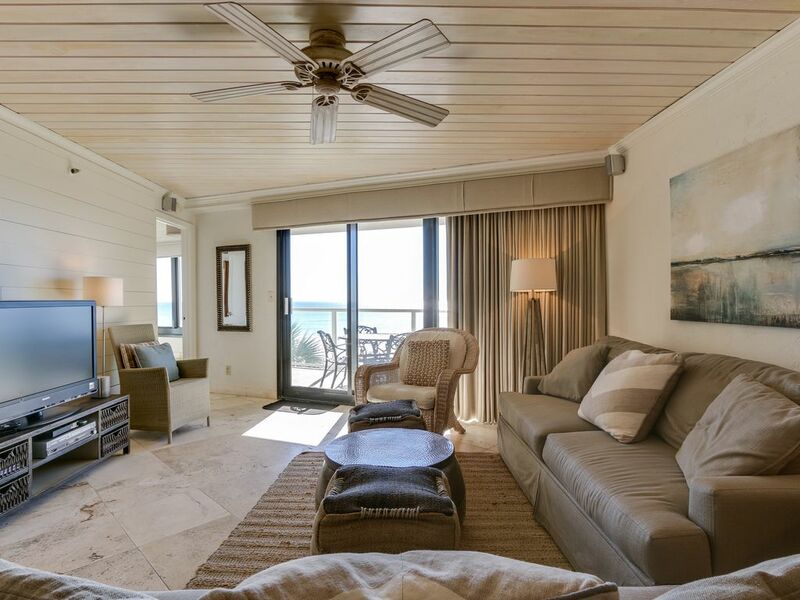 The master suite has a luxurious king-size bed, magnificent views of the Gulf from huge picture windows and its own private door to the balcony. The master bathroom has been completely updated with a gorgeous walk-in shower and antique-style vanity -this bathroom is the perfect place to relax after long days in the sun! The second bedroom has a set of twin-size bunk beds and another twin-size bed; when you add this to the queen-size sofa sleeper in the living room, you have room to comfortably sleep seven! Our Gibson guests have unlimited access to the Resort-wide tram service at no additional cost. Ride over to The Village of Baytowne Wharf for dinner and drinks or get dropped off at the beach for a day of fun! This is an exclusive amenity which is NOT offered by all owners. Book today with Gibson to enjoy the convenience of property-wide transportation today! Make yourself comfortable in our one and two bedroom, beachfront condos located in Beachside II. You’ll enjoy Destin's famous soft and sandy beaches just steps away from your door. Relax and play in the heated, saltwater pool or burn off some stress in the second floor fitness center. Grill burgers on the poolside grills or fill up your cooler with the huge ice machine located on the first floor. We also have a great Gulf-front sun deck for some much-needed quiet time. The parking deck and beach access are securely gated for a comfort of mind. From leisurely strolls to adventurous bike rides, the whole family is bound to have fun on the trails throughout the resort. We cannot wait to see you! * Renter must be at least 25 years of age. * DEPOSIT SCHEDULE: 30% due at booking. 70% due 45 days before arrival. * CANCELLATIONS: 45+ days in advance incur a $200 penalty fee. 30-45 days in advance receive half of the base rate and housekeeping fee back. Cancellations less than 30 days prior to arrival result in full forfeiture. * Snowbird rates available. Payment and cancellation terms differ. Sandestin® is a registered trademark of Sandestin Investments, LLC and Sandestin Real Estate of NW, FL, LLC. Gibson Beach Rentals, Inc. is not affiliated with either of these entities. Use of the word “Sandestin” is for location purposes only. *Daily maid service is an option – available upon request for an extra fee. This was a perfect unit for our family of five. Plenty of space and very clean. Ocean view was a huge bonus. I had plenty of space on the deck to workout in the mornings to the sound of the ocean waves. We watched dolphins 2 of our mornings. Dining table seats 6 comfortably. This was our 2nd vacation in Sandestin. Great resort for families - plenty to do and safe. The only set back - lots of construction in Sandestin. We are so happy you got to have such a delightful stay at BEACHSIDE II UNIT 4238! Dolphins are always a great bonus when here. We love that you are repeat guests who get to enjoy how safe and convenient we are. We are so sorry the updating of the road and new units being added put a damper on your trip. Feel free in the future to call us and we can update you with any events or remodeling that is happening on Sandestin. We hope you consider us in the future for any vacation needs that you may have. Great Condo with amazing views! It was great, The condo was so updated and clean. The location was perfect and the views were amazing. We will definitely stay there again next time we come to Sandestin. Thank you so much for staying in Beachside II unit 4238. It was such a pleasure to host your trip and we are so happy that you enjoyed your stay. Please let us know if you have any suggestion or concerned about your stay. Feel free to keep us in mind for any future stays, as we do offer a discount to all returning guests. Happy travels! We loved our condo. Beautiful view. Robin, we are so glad you fell in love with Beachside II 4238! We love it just as much <3 Come see us again next winter season so we can take good care of you! Have a great year! My wife and I recently booked a one-week stay at Beachside 2 through Gibson Beach Rentals. Everyone we dealt with at Gibson was a joy to work with. We couldn&#x2019;t be happier with the easy check in/check out procedures and the courtesy and professionalism of their staff. The unit was also exceptional. We had one little hiccup with a leaking paint can in a storage closet, which was promptly cleaned up after we reported it. We would definitely stay at this property again, and would rent through Gibson. We are so happy we could help, that's what we're here for! and so happy it was a quick fix and you could enjoy your vacation without worrying about anything. Thanks for the review, we appreciate it and can't wait to have you back again soon. Resort and condo was quiet, private, secure and grounds and facilities are great. Packed on beach, but condo was quiet, beautiful, open space, easy to come in and out. We have stayed in many condos in area, this one is very well done, well kept and decor is updated and pleasing. Fabulous! We're so happy y'all loved the condo and your time spent on the Emerald Coast! Thanks for the great review, we appreciate it and can't wait to have you back for another visit again soon. For years, our family of six has chose Gibson Beach Rentals and have always come away amazed. Amazed and pleased with the service, care and convenience of anything and everything a beautiful beach condo (Beachside II) has to offer. We plan to utilize Gibson Beach Service for as long as we vacation in Destin. Woohoo!! We're thrilled to hear this and so excited you love the condo and had such a great vacation! We absolutely love our repeat guests and always look forward to your return visits. Thanks for the amazing review, we sure appreciate it! Rates are subject to change. Additional fees and taxes applied during booking process. Daily/Weekly Reservations: The Advance Deposit is due at the time of booking. It is calculated at 1/3 of the Total Booking Charges (with a $450.00 minimum). Final Payment is due no later than 45 days prior to your arrival. GBR reserves the right to charge the credit card on file for the balance due. If you are booking your reservation within 45 days of the arrival date, then full payment is due at the time of booking. Monthly (snowbird) Reservations: The Advance Deposit is due at the time of booking. It is calculated at 1/3 of the Total Booking Charges (with a $500.00 minimum). Final Payment is due no later than 60 days prior to your arrival. GBR reserves the right to charge the credit card on file for the balance due. If you are booking your reservation within 60 days of the arrival date, then full payment is due at the time of booking.